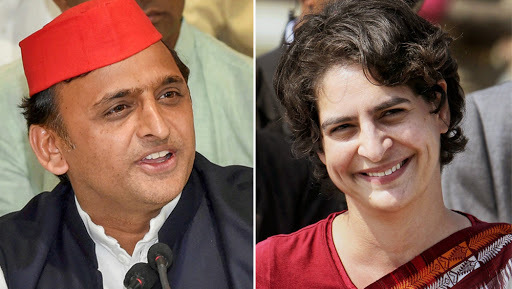 Lucknow, January 26: Days after Congress president Rahul Gandhi inducted Priyanka Gandhi in the party and made her the party in-charge for eastern Uttar Pradesh, Samajwadi Patry chief Akhilesh Yadav on Saturday hailed the decision stating that he is happy as young people are getting chance in politics. Expressing his happiness on the development, Yadav said, as quoted by ANI, “Young people are being given a chance to prove themselves and the Samajwadi Party is really happy about it. I would like to congratulate Congress and its president [Rahul Gandhi]. They took the right decision [of appointing Priyanka as Uttar Pradesh (East) general secretary].” Lok Sabha elections 2019: Priyanka Gandhi May Emerge as ‘Queen’ if She Plays Her Cards Well, Says Shiv Sena Chief Uddhav Thackeray. It is to be known that Yadav had made an alliance with Congress previously in the Assembly elections in Uttar Pradesh in 2017. However, the coalition failed to make any successful outcome, winning just 54 seats in Assembly polls. The BJP formed the government by winning 325 seats. Mayawati managed to secure only 19 seats.